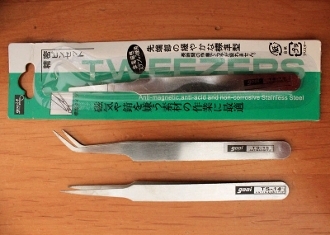 These are very useful tools for collecting and moving both live and dead insects around. They measure 4 to 5 inches and are offered in three styles: pointed, flat-tipped and curved. I personally like the curved ones the best and use them every day, but different ones work better for different applications. I frequently use the pointed ones, held sideways, to collect ants. The flat ones are beneficial in collecting live specimens as you're less likely to accidentally stab your quarry with them. Choose type in the dropdown menu.